Had Palestinian writer Raja Shehadeh (Palestinian Walks) written the screenplay of The Time That Remains (2009), the dwindling time might refer to the chance to hike the hills of Palestine before the Israelis completely cover them in concrete. Or maybe the time remaining before Foreign Minister Avigdor Lieberman succeeds in expelling Arab Israelis from the land of their birth. But the title of Israeli-Arab director/screenwriter Elia Suleiman’s highly personal view of being an Arab in Israel may apply to family relations as much as Palestinian-Israeli relations, as in ‘appreciate your parents while they are still around’, the theme so touchingly sketched in the recent Japanese film Aruitemo aruitemo (Still Walking) (2008). In Suleiman’s Nazareth of 1948 to the present, we see the Arab-Israeli conflict as experienced by and recounted to a boy growing up in a Palestinian family that has stayed on – in what has become part of Israel. 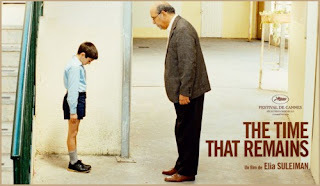 When I first saw the film’s poster, I imagined that the little boy was getting a scolding from his father (it’s actually the school headmaster; little Elia, it seems, is developing a reputation as a political dissident). No, Suleiman’s father Fuad (actor Saleh Bakri dominates the first third of the film as the young resistance fighter) is portrayed as a strong, silent type, who is left for dead after his capture in the 1948 fighting, and who spends the rest of his life under a cloud of Israeli suspicion that he hasn’t abandoned his Palestinian nationalism. We never see Suleiman-père old and frail. He’s the reliable go-to man for family and neighbors in a Nazareth left adrift, cut off from their cousins across the Green Line. At the local school, children sing patriotic songs (but for which country?) in Hebrew and Arabic. Though political themes are ever present (what honest film on the subject could avoid politics? ), The Time That Remains is at times black comedic, and more than one reviewer (including Suleiman himself) has seen shades of Buster Keaton and Jacques Tati in the absurdity of Israeli-Jewish and Israeli-Arab relations. The cinema in France where we saw the film distributed a very helpful flyer with a reprint from the Nouvel Observateur interview with Elia Suleiman, where he explains to Pascal Mérigeau that his novel view of the last sixty-plus years is his alone – and is not a documentary. We read that “at 17 years old, I was accused of being a Communist sympathizer, and had 24 hours to make up my mind”, which is how the young Suleiman ended up in London, which led to New York, which led to Paris… This episode is alluded to in the film, when we see a teenaged Elia getting caught up in the first ‘Land Day’ demonstrations to protest Israeli expropriation of its Arab citizens’ land. For objective students of the Arab-Israel conflict, The Time That Remains should stand up well to scrutiny. For connoisseurs of the absurd, the film will show a collection of war and post-war situations that could be fodder for Ari Folman should Waltz With Bashir (2008) ever get a prequel. In keeping with Suleiman’s ambivalence over matters of nationality, statelessness, and patriotism, The Time That Remains was presented at Cannes 2009 as neither an Israeli nor a Palestinian film, but a product of France, Belgium, Italy, and the United Kingdom. Suleiman, the ‘present absentee’ Israeli/Palestinian/Expatriate and on-camera narrator of his own film, looks on silently at his life and gives us a rare look at the conflicted world of Arab-Israelis. 109 mins. In Hebrew, Arabic and English.